A semiboneless leg of lamb has had the hipbone removed to facilitate carving. This recipe makes enough bread crumbs to use for the Lemon Asparagus Casserole. 1. For the lamb: Adjust oven rack to lower-middle position and heat oven to 450 degrees. Using paring knife, cut 1-inch-deep slits all over lamb and poke garlic slivers and rosemary leaves inside slits. Rub lamb with oil and season with salt and pepper. Place leg meaty side down on wire rack set inside rimmed baking sheet. Roast lamb for 15 minutes, flip, and roast 15 minutes longer. 2. For the crust: Meanwhile, pulse bread, garlic, oil, and parsley in food processor until coarsely ground. Reserve 2 cups crumb mixture for Lemon Asparagus Casserole. Stir rosemary into remaining crumbs. 3. Lower oven temperature to 325 degrees. Remove lamb from oven and brush meaty side with mustard. Press bread crumb mixture into mustard and continue roasting until the internal temperature registers 130 to 135 degrees for medium, 30 to 45 minutes. Transfer lamb to cutting board and tent loosely with foil. Let rest 15 to 20 minutes. Slice and serve. Make Ahead: Make slits in lamb, fill with garlic slivers and rosemary, wrap tightly in plastic, and refrigerate for up to 2 days. The garlic-herb crust may be prepared as directed in step 2 and refrigerated for up to 1 day. Credit for this recipe goes to America’s Test Kitchen. 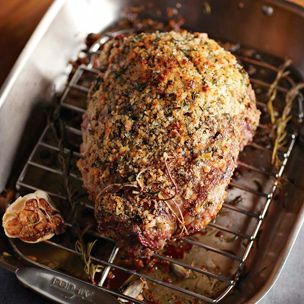 PS – Place a whole bulb of garlic with the top cut off next the leg of lamb to get an intense garlic flavor. This entry was posted in Garlic, Lamb, Roast and tagged garlic pods, Roast. Bookmark the permalink.